Ingredients: Fermented Cod Liver Oil, High Vitamin Butter Oil, organic cocoa powder, organic vanilla flavor, organic stevia leaf, silica. Royal Blend is a mixture of butter oil and fermented cod liver oil. The synergistic mixture was discovered by the famous dentist turned anthropologist Dr. Weston A. Price. SYNERGY OF BUTTER OIL AND COD LIVER OIL - Research shows that butter oil and cod liver oil, taken together, provide complementary factors leading to proper essential fatty acid balance. High-vitamin butter oil contains arachidonic acid (AA), an omega-6 fatty acid, while cod liver oil is rich in eicosapentaenoic acid (EPA), an omega-3. Moreover, the saturated fatty acids in the butter oil promote efficient utilization of the unsaturated fatty acids in the cod liver oil. Finally, butter oil contains a broad and deep range of important quinones including Vitamin K, E and CoQ enzymes while cod liver oil is rich in Vitamin A and D.
HIGH-VITAMIN BUTTER OIL is extracted from dairy milk produced by Guernsey and Devon cows (high butterfat producers) that graze exclusively on the green grasses of the northern Great Plains. This specific combination of climate and irrigation produces a rapidly growing specialized forage, ensuring optimal levels of Activator X as discovered by Dr. Weston A. Price. Activator X and other nutrients are then further concentrated by putting the butterfat through a specialized low-temperature centrifuge process. SUSTAINABLY SOURCED FISH OIL - Green Pasture works exclusively with companies that are certified members of the Marine Stewardship Council. NOT ALL COD LIVER OILS ARE ALIKE - Some types of commercial cod liver oil production might include alkali refining, bleaching, winterization and other methods of processing that may remove saturated fats. Deodorization removes pesticides in the cod liver oil, but unfortunately also removes vitamins A and D. Green Pasture's Blue Ice is the highest quality, most nutrient-dense fermented cod liver oil on the market. 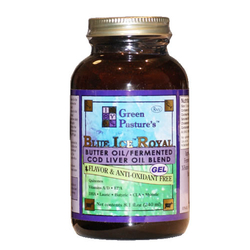 The product has all of the cod liver oil's vitamin D intact because the oil is never heated. Green Pasture is filtered and uses a technique of lactic acid fermentation along with the nutrients already in the cold liver that naturally preserve the oil without adding anything that's synthetic.